Two women have been arrested for allegedly selling a 2-day-old baby in Igbo-eze local government area of Enugu state. They were apprehended by the village’s central neighborhood on Friday, March 29th. 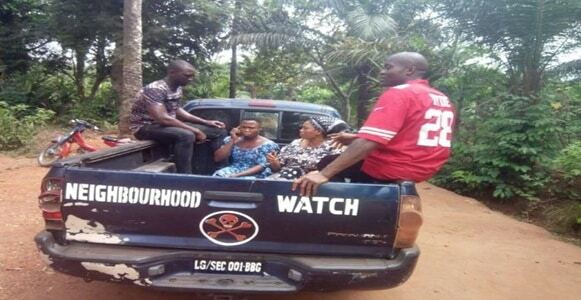 One of the suspects identified as Mrs. Kate Ugwu (the light-skinned woman), confessed that she was contacted by one madam Ekwutosi Onodu to help her sell her sister’s child as they do not need the baby in their family. I only helped a friend, because the mother of the child is too young to be a mother as she is just 13 years old. So i contacted a friend of mine in Rivers State who promised to pay the sum of 300k and i delivered the package to him already so we are now waiting to get paid so we can take care of the little girl (Toochi). When asked how long she has been in the business, Mrs Kate said this is her first time but the other suspect, Mrs. Ekwutosi said she was telling lies and that she (Kate) is known for the business – that’s why she was contacted. Meanwhile, the young mother of the child has been rushed to the hospital as she was found bleeding inside Ekwutosi’s room.